The amplifiers have truly impressive resolution and perspective. They will deliver amazingly precise and powerful bass while maintaining resolution in the entire audio band. ZapPulse 800XE will really shine driving quality speakers. 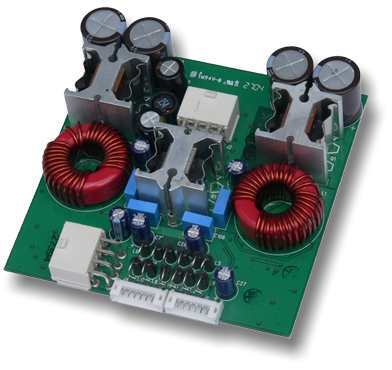 Output power per module is 2*200W in 8 ohms or 800W bridged. The 800XE amplifier module can be connected directly to a professional balanced output. However, a good, low impedance driver is needed to maintain low distortion. Hence, for most applications the buffered version is recommended. The high quality buffer will add 3dB amplification and increase input impedance to 10k ohm to match most pre-amplifiers. 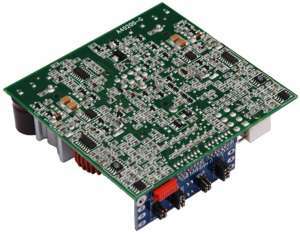 Based on numerous listening tests the buffer is slightly slew rate limited as standard. In most HiFi setups this is optimal. However, the slew rate limiter can easily be changed/removed in 4 steps using small, gold plated jumpers. The supply for the buffer is filtered on the PCB but still requires a regulated supply. The buffer can be driven with either balanced or unbalanced input. Both buffered and unbuffered versions require a regulated +/-12V supply (<0.5A) in addition to the +/-48V to +/-70V power (typically from rectified 42VAC). Mechanical drawing / drilling template.